This continues a series on the best Yankees at different positions. Today: second base. I tried to talk myself out of Tony Lazzeri at second base, because I kept wanting someone to be better. He’s not even a top 10 all-time second baseman. But he’s a Hall of Famer (albeit from the ’20s and ’30s when that was easier than any time since). And he played second base 12 years for the Yankees. Willie Randolph played 13 and I loved Randolph, but Lazzeri had more hits, homers and RBI as a Yankee, and a higher batting average. Lazzeri topped 100 RBI seven times and scored more than 100 runs twice (Randolph never topped 100 in either category). Lazzeri topped .300 in batting five times, including a .354 performance in 1929. He was a bona fide member of Murderer’s Row and clearly the best Yankee second baseman ever, somewhat to my surprise. 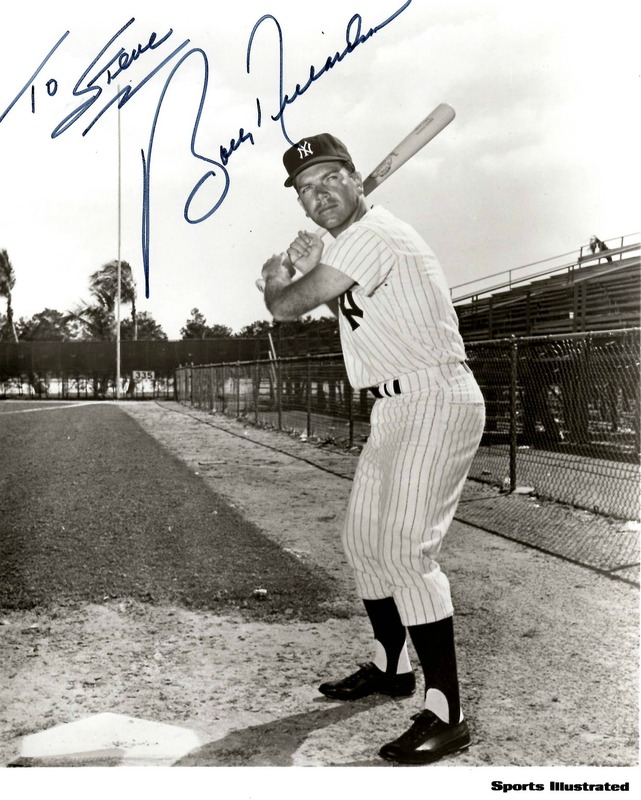 He anchored the Yankee infield for five world-champion teams, bridging the Ruth and DiMaggio years. This is an easier call than I anticipated. I also expected Robinson Canó to rank lower on this list. I was surprised to see he had played nine years as a Yankee, but not surprised to see that he topped 100 RBI three times, scored 100 runs four times and hit over 200 Yankee homers. I don’t know if he’s going to make the Hall of Fame, or if he should, but he got his career off to a Hall of Fame start playing in New York. He also earned two Gold Gloves with spectacular, if not always consistent, defense. I tried to push the other guys on this list above Canó because he kind of disappointed me with his post-season play (he was awful in the 2009 World Series and hit only .222 in 51 post-season games). But his regular-season play pushed him up here and even gained him consideration for No. 1. I moved Randolph into third place because he played the position strongly on offense and defense for the Yankees for 13 years. He was great at drawing walks (1,005 for the Yankees, including a league-leading 119 in 1980). I think Randolph illustrates that I don’t argue for Hall of Fame election for every good Yankee player. Yes, he was better than some 1920s infielders in the Hall of Fame, but they don’t belong there and neither does he. Lou Whitaker and Frank White were better contemporary second basemen in the American League. But Randolph was a cornerstone of the Yankee champions of 1976-81, when they won two World Series, two more A.L. championships and a fifth division title. He was a six-time All-Star and absolutely belongs on this list. Joe Gordon had to wait a while to get into the Hall of Fame not just because of anti-Yankee bias and the voters’ bias in favor of longevity. He also had to wait because he was the odd beneficiary in 1942 of the writers’ bias against Ted Williams. Gordon had an outstanding year: hitting .322 with 18 homers, 103 RBI and great defense for the pennant-winning Yankees. But Williams won the Triple Crown that year: .356, 36, 137. Williams also led the league in runs (141), walks (145), total bases (388), on-base percentage (.499! ), slugging (.648) and OPS (1.147). You know what Gordon led the league in? Strikeouts (95) and grounding into double plays (22). It was probably the most ridiculous MVP vote in history when the Baseball Writers’ Association of America voted Gordon the MVP over Williams. But that wasn’t Gordon’s fault. He didn’t have Hall of Fame career numbers, but he sacrificed two prime years to serve in the military during World War II. And he was an All-Star five straight years before going into the military and four straight years after coming back. How many players who were All-Stars nine straight seasons aren’t in the Hall of Fame? And it probably would have been 11 if the war hadn’t interrupted his career. Gordon would rank ahead of Randolph based on his full career, but he played only seven years for the Yankees (he was traded to the Indians after the 1946 season for Allie Reynolds, who should join him in the Hall of Fame). Gordon hit well in only two of his six World Series, but he helped the Yankees to four world championships and the Indians to their last title, in 1948. In another interesting swap, Gordon went from the Indians to the Tigers in 1960 for Jimmy Dykes in a rare trade of managers. Bobby Richardson may have the biggest disparity between regular-season hitting and World Series hitting of anyone who played substantial World Series time. He was a good player, making seven All-Star teams, leading the league with 209 hits in 1962 and finishing second to Mickey Mantle in the MVP vote that year. But he was only a .266 career hitter, with 34 homers and 390 RBI in 12 seasons, all with the Yankees. In 1960, he drove in a record 12 runs, also scoring eight and hitting two triples and a grand slam (tying a record he still shares; no one has hit a second World Series grand slam). His 11 hits were one short of the record. He was the only World Series MVP ever from a losing team. In 1961, his nine hits tied a record for a five-game series that he still shares. In 1964, he set a record that he still shares with 13 hits in a World Series. He hit only 4-for-27 in the 1962 World Series, but that Series is still best remembered for his spectacular Game Seven catch of a Willie McCovey line drive, with Matty Alou on third with the tying run and Willie Mays on second with the winner. While his stellar hitting in other Series was far better than his regular-season hitting, the defense was no surprise: 1962 was the second of five straight Gold Glove seasons for Richardson. Who else in World Series history set offensive records in three series and made a Series-saving defensive play in a fourth, all in a five-year stretch? If you were compiling an all-time World Series team, Richardson has to be your second baseman. 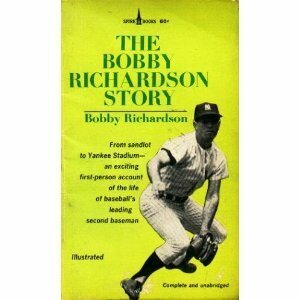 I’ll disclose a bias here: Richardson was my childhood baseball hero, even above Mickey Mantle. I met him in the 1970s, when he came to a baseball event in Stanton, Iowa, and I was an editor in nearby Shenandoah. That’s where I got the autographed photo. Billy Martin’s autograph on a ball belonging to my son Mike. I tried to get Billy Martin onto this list, but he played only seven years (three playing 100 or more games) for the Yankees. His only All-Star season was 1956. He hit .333 in World Series play, had a spectacular game-saving catch of his own and still shares the record for 12 hits in a six-game World Series (1953). Alfonso Soriano was spectacular in three years at second for the Yankees, leading the league in 2002 with 209 hits, 128 runs and 41 stolen bases (not to mention 39 homers and 102 RBI). But he played second base for the Yankees for just two years. And he was mostly horrible in the post-season, striking out 11 times against the Red Sox and nine times against the Marlins in the 2003 post-season. He didn’t play long enough at second for the Yankees or well enough in October to push Richardson off this list. Chuck Knoblauch had a career to compare with some of the players on this list, if you count his Twin years, and he hit well for the Yankees and contributed to three World Series titles (plus a fourth with the Twins). But you just can’t overlook the throwing problems (26 errors in 1999 and 15 in part-time play in 2000) that forced the Yankees to move him to left field. Speaking of throwing problems, Steve Sax had two All-Star years at second base for bad Yankees teams. Sax’s throwing problems were years earlier with the Dodgers. He played well at second for the Yankees, but not long enough to rank in the top five. 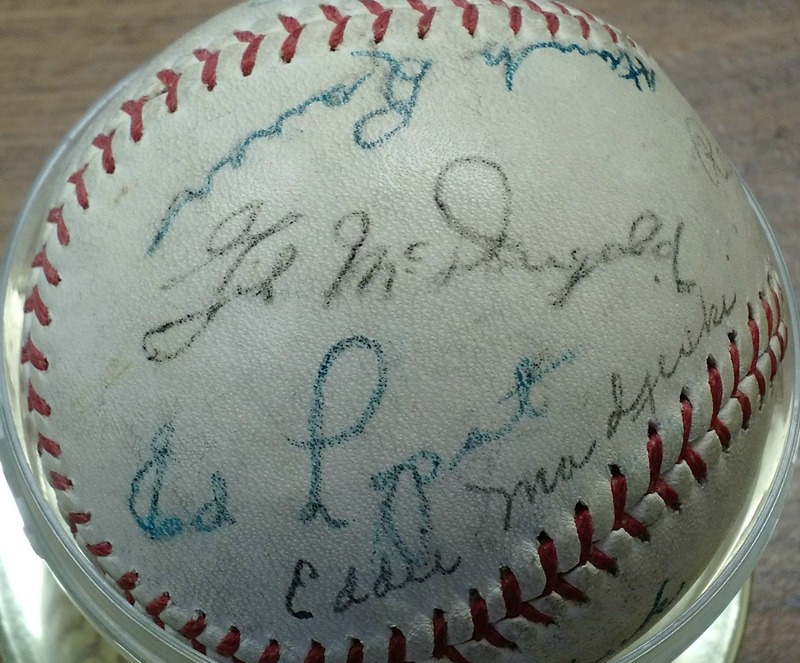 Gil McGougald’s autograph (along with Hank Bauer’s, Ed Lopat and Eddie Madjeski. Gil McDougald might lead a list (if I ever make one) of Yankee utility players. He played his full 10-year career for the Yankees, making five All-Star teams. But he can’t rank very high at any position, having played 599 games at second, 508 at third and 284 at shortstop. He had only five seasons with 100 or more games at any one position, two at third base, two at second and one at shortstop. If you were ranking all-time Yankees at all positions, he might pass up some people on this list, but not just ranking second basemen. Jerry Coleman was an All-Star in 1950, but played only 572 games at second base. He topped 100 games in only four of his nine seasons, all with the Yankees. He’d rank below McDougald both as a second baseman and a utility fielder. With bigger stars all off to war in 1944-45, Snuffy Stirnweiss led the American League twice each in hits, runs and stolen bases and in 1945 added titles in batting, slugging and OPS. But he wasn’t as good with the major leagues at full strength. His only All-Star year, 1946, he played more at third base than second. He was a significant contributor to the 1947 champions, but became a part-time player after that. Luis Sojo deserves special mention. In parts of seven seasons with the Yankees, he did not play 100 games in a season even once, so he was never more than a part-time player. But Yankee fans will always appreciate his clutch 2000 post-season (9 RBI in 14 games). Similarly, Brian Doyle never played even 40 games in a season for the Yankees. But when Randolph was injured for the 1978 post-season, Doyle hit .391. He was 7-of-16 with 3 RBI and 4 runs in the World Series, a pretty good place to play the best baseball of your career. I also must mention Horace Clarke, who followed Richardson at second base. He anchored the position from 1967 to 1973, horrible years for the Yankees. He was a good fielder but a bad hitter. I call the drought between the 1964 and 1976 World Series teams the “Horace Clarke years,” which probably isn’t fair to him. But the Yankees weren’t very good then, and neither was he. The Yankees are not a contender for the best tradition at second base. The Cardinals (Rogers Hornsby, Frankie Frisch, Red Schoendienst) and Cubs (Johnny Evers, Billy Herman, Ryne Sandberg) both were the primary teams of three Hall of Fame second basemen, including someone who’d make most top-10 lists (Hornsby, Frisch, Sandberg). And the Cubs got Hornsby for an MVP season and three more years. The White Sox (Eddie Collins and Nellie Fox), Indians (Nap Lajoie and Gordon), Reds (Joe Morgan and Bid McPhee), A’s (Collins and Lajoie) and Giants (Frisch and a year of Hornsby) each matched the Yankees with two Hall of Fame second basemen. I haven’t researched this deeply enough to be confident with rankings (that might be a future post), but I see the Cubs at No. 1 here and the Yankees about fifth. I explained my criteria in the post on first basemen, so if this seems familiar, it’s because I cut and pasted that explanation here, then adapted it for second basemen. If a player is in the Hall of Fame (Lazzeri), that carries considerable weight with me. I value both peak performance and longevity, but peak performance more. Canó didn’t play at second for the Yankees as long as Randolph, but Canó’s peaks were higher. I rank players primarily on their time with the team, so Lazzeri and Richardson stand out not just for their great careers, but because all their time was spent with the Yankees. Frisch made it to Cooperstown and had Hall of Fame seasons for both the Giants and Cardinals, so he counts heavily for both teams, but not as heavily as Sandberg does for the Cubs, because he played most of his career and all of his great seasons in Chicago. Time at the position is important, too. If Soriano had stayed with the Yankees and moved to left field (as he did when he moved to the Nationals in 2006, two years after the Yankees traded him to the Rangers), his performance in left field would only be a tie-breaker, not a big factor. Post-season play and championship contributions matter a lot to me. I should add that I don’t consider those to be the same thing. Lazzeri contributed to five Yankee world championships, to three for Richardson, so that’s an advantage for Lazzeri. However, Richardson played better in the post-season (Lazzeri was good, but you don’t find him among all-time leaders, let alone record-holders, in World Series batting). If two players were dead even at a position for the Yankees, I moved the one with the better overall career ahead. For instance, Gordon’s play for the Indians (and his Hall of Fame election) helped me place him above Richardson for fourth place. Special moments matter, too. If someone had been tied with Richardson on other factors, that catch to save the 1962 World Series would have given Richardson the final spot on the list. Who do you think is best? Unless noted otherwise, statistics cited here come from Baseball-Reference.com. Look around the baseball diamond, and at nearly every position, a Yankee was one of the best ever. But not at starting pitcher. We say that pitching wins championships, and the Yankees through the decades have had excellent depth in good starting pitchers, and sometimes great starting pitchers. But none of the all-time greatest starting pitchers spent most of their careers with the Yankees. If you expand your best-ever list to 20 or 25, Whitey Ford usually gets a spot, but Yankees remain notably absent, or low, from any best-ever discussion of starting pitchers. And they’re prominent in such discussions at nearly every other position. I actually intended to write a post sometime this year making the case for Joe Torre‘s election to the Hall of Fame. But the Expansion Era Committee chose Torre to enter the Hall of Fame this year, along with his managing peers Tony LaRussa and Bobby Cox. All three managers are clear Hall of Famers, ranking third (LaRussa), fourth (Cox) and fifth (Torre) on the all-time wins list for managers. Torre was a strong candidate for the Hall of Fame as a player and probably should have been chosen on that basis, regardless of his performance as a manager. He and Elston Howard were the best catchers of the 1960s and most people who were best of their era at a position are in Cooperstown. He was a nine-time All-Star and most eligible players who’ve made that many All-Star teams are in the Hall. He also was MVP in 1971 (after moving to third base), leading the league in batting, RBI and hits. The Yankees are pretty much dead now, having lost two games at home and facing Justin Verlander in Detroit in Game 3, right? The Yankees lost two home games to the Atlanta Braves in 1996 and were facing Tom Glavine in Game 3. Glavine is a sure Hall of Famer who won the Cy Young Award two years later. Verlander is well on his way to Cooperstown and won the Cy Young and Most Valuable Player awards last year. Glavine was 15-10 with a 2.98 ERA in 1996 and three wins already in that year’s post-season. Verlander was 17-8 with a 2.64 ERA and two wins in the first round of this year’s post-season. (All these stats come from Baseball-Reference.com. As strong as my pro-Yankee bias is, I think Justin Verlander should be the American League Most Valuable Player this year. Yankees Curtis Granderson and Robinson Canó had outstanding years that merit MVP consideration. So did some non-Yankee position players: José Bautista, Miguel Cabrera, Jacoby Ellsbury and Adrián González. When baseball writers (MVP voters) discuss the MVP contenders, you hear one of the dumbest statements and one of the strongest biases in baseball, almost as strong as the anti-Yankee bias: Pitchers shouldn’t be considered for the MVP. Umpires make horrible calls in the World Series, just like they do in the regular season. And champions keep on playing and win their championships. Thursday’s World Series game included two bad calls at first base. And the umpiring didn’t affect the outcome of the game at all. The Yankees just kept taking care of business. They didn’t need the extra runs they might have scored in the seventh inning. And Mariano Rivera would have gotten another out if the umpires hadn’t helped him in the eighth.